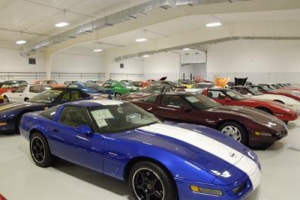 The Mark Pieloch Classic Car Collection features over 130 American-made classic and antique cars. Pieloch is an avid collector who loves to take a “sorry old car” and restore it back to its “brand new car” look. Although he collects cars of all makes and models, muscle cars from the 1960s through 1971 remain a favorite. The muscle car designation refers to a specific group of American-made vehicles that boast a high-performance V-8 engine fitted into two-door mid or full-sized car. Car enthusiasts point to the 1949 Oldsmobile Rocket 88 as the birth of the muscle car concept. Designed by General Motors, the Rocket’s never-before-seen engine was the first high-compression overhead-valve V-8 in the United States. Competition soon followed and nearly every automaker came up with its own version of a lightweight but efficient V-8. The 1950s muscle car was big. Safety concerns caused a decline in sales and auto manufacturers scaled back production. Research behind the scenes didn’t stop, however, and the muscle car surged back in the 1960s. Sportier looking cars had been introduced, as had smaller, compact models. Pontiac’s 1964 Tempest GTO brought the muscle car blazing back into the American scene. Looking like a typical mid-sized coupe or convertible, the GTO hid a powerful 389 V-8 engine that appealed to young and old alike. Competition followed almost immediately, with Oldsmobile, Buick and Chevrolet introducing their own versions. Classic 1960s muscle cars include the Ford Fairlane, Dodge Charger, Chevy Camaro and Ford Mustang. Muscle cars were designed to grab the attention of young people who wanted an affordable high-performing streetcar with a sleek look. The Chevy Camaro made its debut in September of 1966 for the 1967 model year. Developed to compete with Ford’s Mustang, the two-door Camaro was built on a newly designed rear-wheel drive F-body platform and sold as a coupe or convertible. The second generation Camaro was introduced in 1970 and sported a restyled larger and wider design. Ford publicly introduced its iconic Mustang in 1964 at the New York World’s Fair. The design was based on existing Ford products to make it more affordable to consumers and less expensive to build. First generation models came in a notchback coupe or convertible style and had unique design touches that included a running horse on the grille and scallops along the flanks. The car went on sale on the lots of Ford dealers the same day it was introduced and surpassed the first-year 100,000 unit projected sales forecast in three months. The Boss Mustang was developed as an answer to the more powerful Chevy Camaro. The Ford Boss 302 engine was introduced in 1969. It was designed specifically to meet the Trans-Am series racing guidelines. The 1970 Boss Mustang could accelerate from 0-60 mph in 6.9 seconds. Pieloch credits his older brothers’ good nature with sparking his love for classic 1960s and early 1970s muscle cars. His older brothers had numerous muscle cars and were happy to drive their kid brother around. 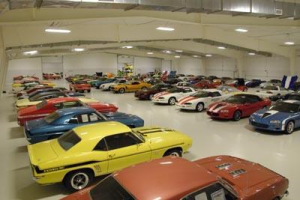 The Mark Pieloch Classic Car Collection now features over 25 Camaros and a complete set of 1969-1971 Boss Mustangs. It’s truly a muscle car enthusiast’s dream.